I want a new antenna for my loft in order to listen to airband. This may sound silly, but im stuck between the wideband scanmaster and airband specific airmaster. This is mainly due to the differences in length. My telescopic antenna performs better when it is extended fully, which may be due to the greater height. It gets 3 bars for scottish control when extended to around 1 meter and 2 bars at 60 cm, therefore wouldn't the wideband scanmaster achieve greater signals as well due to its longer length compared to airmaster. The telescopic preforms better at longer lengths in the loft, so wont a base antenna also preform better. Last edited by waxmax on Mon Dec 31, 2018 6:51 pm, edited 1 time in total. Thankyou very much, do you listen to airband on it often? don't listen to airband, stick to around 166Mhz and 450-470Mhz. wanted to see if it was better than my discone and it wasn't. Discone discone resonant at wider range of frequencies. for airband i'd say use an aerial that's designed for that band but others here are much more knowledgeable about aerials than me. deadite66 wrote: don't listen to airband, stick to around 166Mhz and 450-470Mhz. the scanmasters seems better on airband frequencies then the discone tbh. A proper airband specific antenna will always perform better than a wideband antenna. If you look at the link deadite66 posted you will see lots of lines higher up the page & very little at the bottom of the page. So that antenna is not resonant in many places. This is what a Resonant antenna looks like. A antenna length that is too long or too short for the wavelength will not match the radio wave & thus will have a mis match..Poor SWR, among other things. The problem with RX only antennas is that sometimes those who sell them make claims that are untrue. So just because a antenna is claimed to be for airband, it does not always mean it is. If you are putting the antenna in the loft, then have a look at the Nomad antenna. The Slim G. They will make these for airband & at £22 including postage they include everything you need to simply hang it in the loft & then plug it in & play. I use similar home made antennas on the amateur radio bands & have had some very good contacts on mine. m0lsx wrote: A proper airband specific antenna will always perform better than a wideband antenna. If you look at the link deadite66 posted you will see lots of lines higher up the page & very little at the bottom of the page. So that antenna is not resonant in many places. What does the “y” axis actually represent for this graph. from a laymans understanding when you transmit at a frequency that matches the aerial it will meet no resistance/feedback so SWR of 0, when the aerial doesn't match it can't transmit all the power fully so a high SWR. 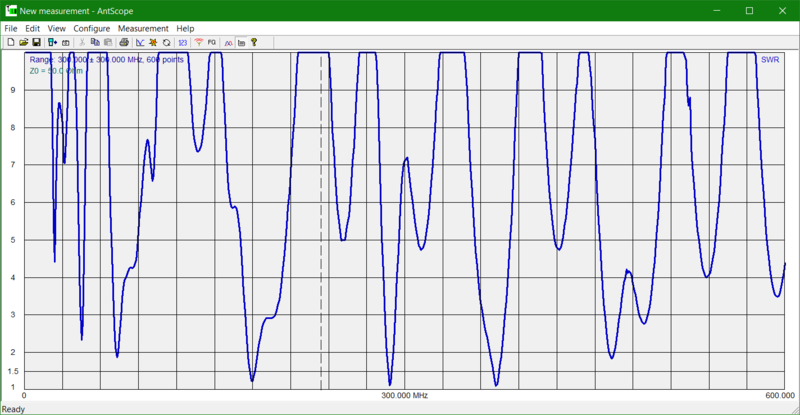 the Rigexpert plots the SWR at points along a frequency range so you can see what frequency ranges an aerial is good for. i wish the rigexpert software displayed more frequencies along the bottom but it looks like the B1300-N seems poor between 100MHz-200MHz. when you shop online the site may display a SWR graph for the aerial. So back to my original question though: should I get the scanmaster b1300 due to its larger length? As this seems to be case with my telescopic ?